splendid isolation: A second mortgage for sunflower hearts. A second mortgage for sunflower hearts. We kind of knew that the greenfinches were getting through a lot more of them than they usually do. 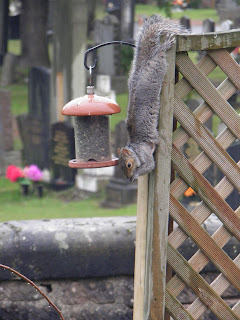 The squirrel had better be careful though - if it keeps stuffing itself like it has been doing up til now, it's no' going to be able to outrun the dugs for much longer!